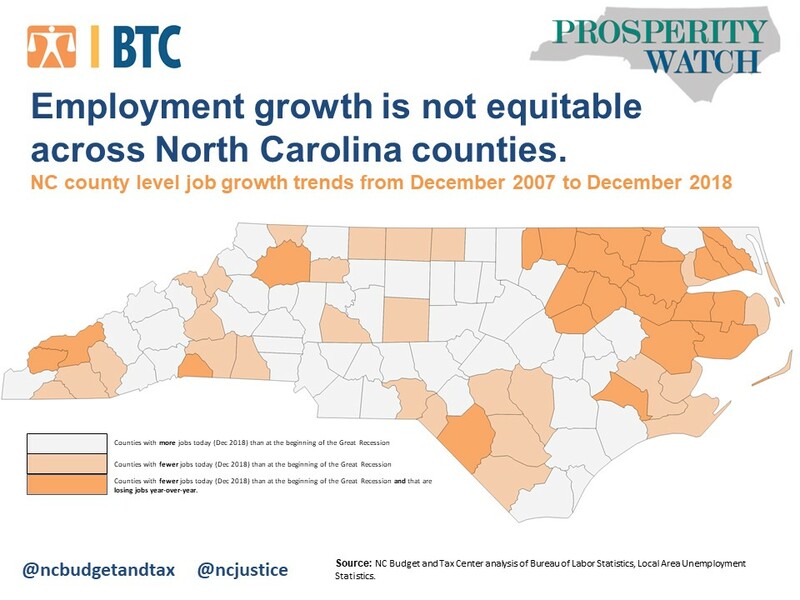 Topline statewide indicators, such as the unemployment rate, can provide the impression that North Carolina is forging ahead in the right direction economically – and in some places that is very true. Wake and Mecklenburg counties lead the state in jobs gained since December 2007 both in raw numbers and by share. Of the 357,000 net jobs gained since the beginning of the Great Recession, these two counties accounted for 297,000, or 83 percent of them all. These and other urban counties like them represent an out-sized share of the state’s economic prosperity. By delving a bit deeper, it is apparent that this prosperity is not equitably distributed among counties throughout the state. There are 49 counties that have not fully recovered since December 2007 — that is, they have fewer jobs today than they did 11 years ago. However, while the majority of these counties’ employment levels are growing year over year, 23 communities are gripped in a troubling trend. According to labor market data, these “double whammy” counties not only have fewer jobs than at the beginning of the Great Recession, but they are also losing jobs year-over-year. A prime example of these compounding woes is seen in Warren County, a community of approximately 20,000 people in northeastern N.C. In December of 2007, employment stood at 7,356 but declined to 6,300 jobs in December of 2017 and further declined to 5,973 in December of 2018, an erosion of nearly 20 percent of jobs. Altogether, 38,000 or 11 percent of jobs have vanished from these 23 counties since the beginning of the Great Recession. As the map indicates, many of these “double whammy” counties are concentrated in northeastern North Carolina. This would suggest, quite strongly, that serious underlying challenges in these communities are preventing the region from fully recovering from the Great Recession, many of which are embedded in the historical context of the Black Belt of the American South. Only intentional policy will rectify the deep inequities hampering large swaths of the state economically. Failure to take the necessary steps to ensure all regions are positioned to thrive will leave North Carolina more vulnerable to the shocks of a future economic downturn.